Kids t ball has been around for about thirty or forty years in most parts of the world. It is usually pronounced as t ball, but sometimes on paper it is written as teeball, tball, t ball or t baseball. However it is called or written, this game has allowed millions of young children the chance to play a kids’ version of baseball. 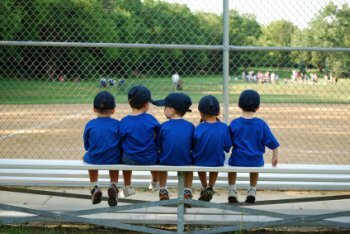 Before kids t ball, most little league baseball started at the age of seven or eight. And these young players had to start with kid pitch baseball. It was brutal to say the least. Kids that young just do not have the skills to pitch a baseball with much control. But along came t ball and kids as young as three were able to start playing the teeball version of baseball. It has helped them learn the many parts of the game before they have to face live pitching. One of the great things about kids that are so young playing baseball is their innocence. 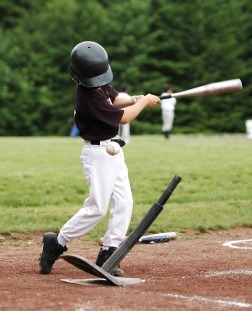 They know what to do with the bat, but not what to do after hitting the ball. Somehow they land on first base and then the next batter hits the ball. Everybody again yells run, but to where? Oh, that coach on second is waving his arms to come on. I’ll go see what he wants. Or they may be able to stop a slow grounder, but then what do they do with the ball? They see everybody else running for a groundball so they follow suit. Yes, that is what makes the game so much fun for everyone. The kids enjoy the learning and hitting the ball. And certainly they love the snacks after the game. The parents and grandparents love seeing their kids have so much fun. And there is always a good laugh or two at any kids t ball game. The rules of the game are pretty simple. Every tball league has their own version of rules though. Most allow the whole team to be in the batting order. And usually there is a run limit or batter limit to the innings. Seldom do you see the emphasis being placed on winning the game. In fact most leagues do not keep score or track wins and losses. Even the most competitive coaches know better than to press for victories. Most of the kids won’t know how to respond to that pressure anyway. 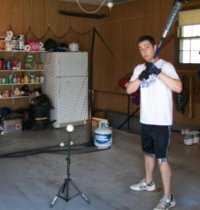 About the best a coach can hope for is helping players learn to take a good swing. And then the next step is teaching them to run the bases. On defense working on throwing and catching the tee ball is about the limit of exposure. This leads into my next subject, coaching kids t ball. Do you enjoy being around kids? 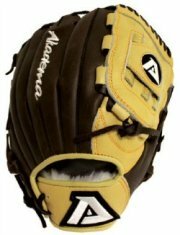 And do you have the patience to teach eager children the simple steps of hitting a ball and running the bases? Those are the two big qualities that any good t ball coach needs. Yes, just about any parent can handle this job, mom or dad. And it is such a rewarding job. You can see the players learning and improving each and every week. And all the other parents appreciate you taking the time and patience to teach their children. It is a great way to meet and learn many of your kid’s future friends and their parents. In three or four years your Johnny may want to spend the night at Joey’s house. Because of your coaching a tball team you may Joey and his parents very well. But you say you no know nothing about kids t ball or very little about baseball? No problem here, I’ve got you covered. 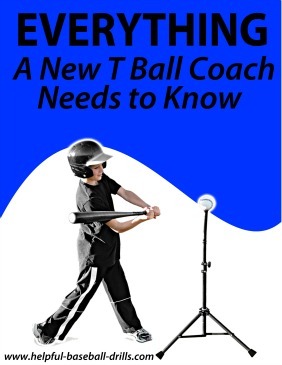 After coaching my three sons and helping with three of my grandsons, I have written an easy to read 40 page t ball manual called, Everything a New T Ball Coach Needs to Know. It will take you from your first phone calls to parents, thru the whole season and ends with your season ending banquet (pizza get together). And it is available for immediately download right after a small fee is paid right here, download. I hope you enjoy the eBook and I know you will love coaching kids t ball.